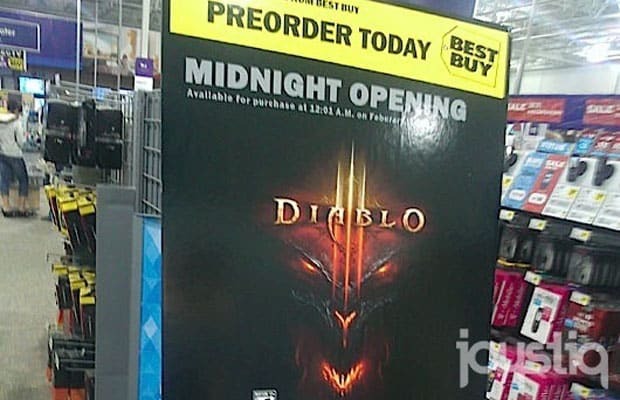 It looks like the release of the highly anticipated Diablo 3 may be right around the corner—Joystiq received the above image, which shows a date of Feb. 1 with a midnight release, from a loyal Twitterer. They then called the Best Buy (located in Minnesota), where an employee confirmed the information. Apparently Blizzard forgot to tell us before Best Buy put their signs up. The retailer&apos;s site lists the same thing, and another retailer—UK store Gameplay—has listed a Feb. 3 date. This all seems legit, so we&apos;re left wondering who at Blizzard forgot to send out that press release. Regardless, we&apos;re looking forward to playing the game in less than a month. Did you expect it to be coming out so early in the year after it was pushed back from a 2011 release? Let us know in the comments or on Twitter.